I think that I have gained lots of cooking and baking knowledge from blogging. Exactly one year ago, when I started to learn bread baking, I tried to bake chocolate chip hot cross buns but they were as not as yummy as I expected as they were not as fresh and soft on the next day. I wasn't satisfied with this bake and really wish that I can bake these buns to acceptable level of perfection. To year-marked my progress in baking, I have decided to bake the same kind of hot cross buns again this year. Instead of using the standard recipes from the Breville breadmaker manual, I challenge myself to see if I have learned to choose a better recipe for this bake. These hot cross buns (with no bread improver) are very soft and delicious and they are still great on the next day. So, I asked myself... Have I learn well enough to identify good recipe? Or am I just lucky? LOL! These buns I'm very satisfied now seeing all my improvement in bread baking. The only disadvantage of this recipe is that this bread dough is very sticky and soft to handle and would highly recommend kneading the dough using a mixer or a breadmaker. Otherwise, this recipe is really good! The recipe is largely modified from the one from Epicurious. If you have a stand mixer, combine the flours, water, milk, yeast, salt, and sugar in the bowl and fit the dough hook. Add the egg and butter and mix to a sticky dough. Add the dried fruit, orange zest, and spices (I didn't add this) and knead on low speed until silky and smooth. (You can do this by hand, but it will be sticky to handle) Cover the dough and let rise in a warm place for about 1 hr, until doubled in size. Deflate the risen dough and divide into 8 (or 15) equal pieces. For this bake, I have baked 6 chocolate chips buns and 9 plain spice-less buns. For the chocolate chip buns, I kneaded in 1/3 cup of chocolate chips in all 6 divided doughs and I kept the rest of 9 doughs as plain buns. Preheat the oven to 400°F (or 180°C fan forced). To make the crosses, whisk together the flour and water until smooth, then transfer to a pastry bag and snip off the end to make a fine hole. 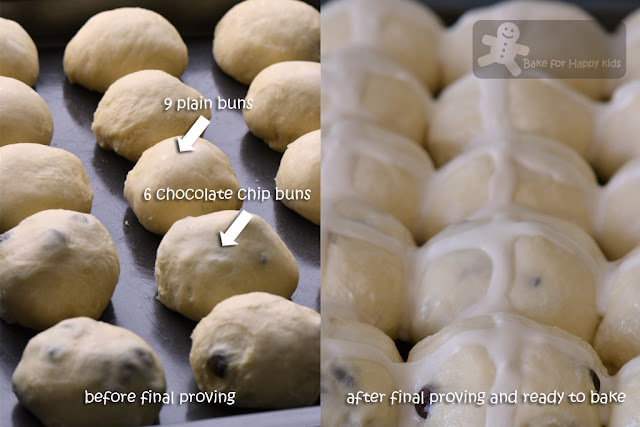 Transfer the risen buns to a baking sheet (I did this before the final proving) and pipe a cross on top of each one, then bake for 15 to 20 min (I bake mine for 15 min). Meanwhile, melt jam with the water in a pan (or mix honey with warm water). Brush over the buns to glaze as you take them from the oven. Transfer to a wire rack to cool. Serve warm, cold, or toasted. I think replacing the raisins with chcoclate is an excellent idea. I love these look really,really nice!!! 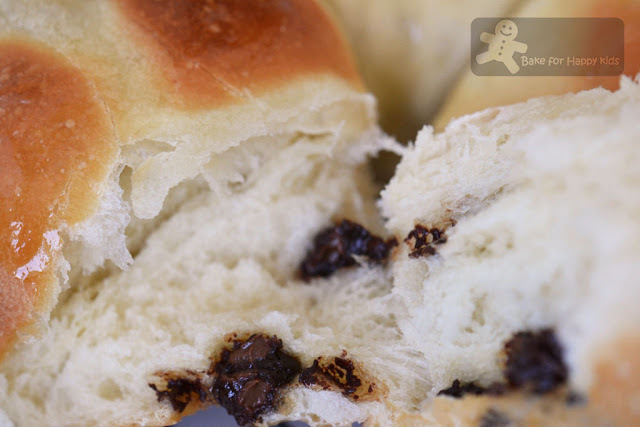 You can't beat hot cross buns with a little bit of chocolate! Awesome. Your buns looks really soft and fluffy. Must be really delicious with the choc chips added in. I think I would love the plain ones spread with some generous serving of cold salted butter, and a cup of hot black coffee! Yum! the buns look really soft and fluffy ! I am sure they taste delicious too from the gorgeous pictures. Chocolate is always a welcome addition! Looking at the above stuff i am sure that any one would just fall in love with the food items. With only a few weeks to Easter, these little buns are perfect for the celebration! love the idea of non-spiced hot cross buns - makes them perfect for non-easter occasions heh :) and yes, blogging has made me learn so much more too! Looks so good with my coffee right now,i like hot sweet buns,great recipe !! 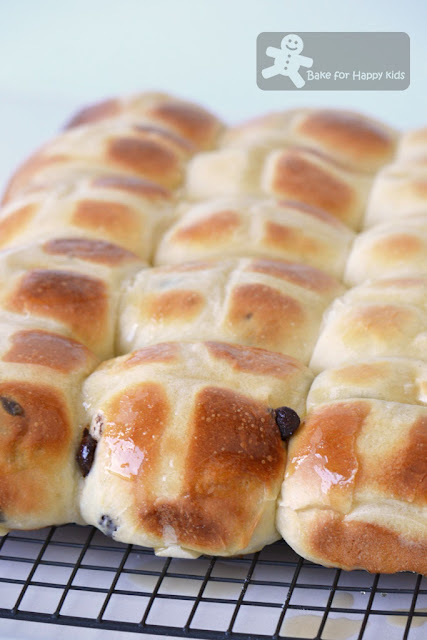 These really look delicious - I LOVE hot cross buns and what a fabulous idea to add choc chips!!! brilliance! very neat and cute! i dont think it's lucky, it's definately the experience and the baking skills you acquired that made these rolls a success!! However you managed to do it, they look great! Tried leaving a comment at this post earlier but not getting through! Oh Yummy! Hot cross buns are on my-to-bake list and my DH would probably say no chocolate chips please (I will sub with sultanas or golden raisins!). I can tell that the buns are soft. Well done! Hi Zoe! Great job on these. It's always fun to see how far you have come with cooking each year and how much improvement has been made. I need to get a dough hook for my kitchen aid so I can make some of these amazing recipes you have posted. I have not gotten far enough with my baking to where I feel comfortable enough to add different ingredients or combinations. That is a real skill. I think if I took some pastry classes I would be a much more confident baker. Thank you so much for trying to find the perfect recipe for these buns, Zoe! I love reliable recipes. Have a great day! Hugs! I feel the same way myself about blogging :) These sound so yummy! Yummy and cute!Have a lovely week,dear! I wish I was home to make these; my mom used to make these for Good Friday; I am saving your recipe for sure. Do you love your Breville Breadmaker. I have been eyeing them. i made hot cross buns the other day and they were super delicious, but they are not as good the next day. una realización perfecta y bella me encanta ,abrazos hugs,hugs. Bread used to be one my biggest kitchen fears. (Now it's croissants.) These hot buns look great! Love the chocolate action going on. I love the look of these. They are stunning. I just need someone to make them for me! They look so good, I love chocolate chips a lot more than raisins, great switch! Thanks for the follow, following you back. Love your blog! Wow Zoe, this buns looks great and I love the idea of chocolate chips in it...love the pictures as well. wow! this looks amazing! I love looking back on my blog and seeing how far I've come in a year or so! Is it time for hot cross buns already? I remember just baking them for easter a while ago ... time sure flew by. These are being featured at Bake with Bizzy. I am so glad you linked up. Thanks. You have wonderful recipes here. I see, I have to spend more time, going back in time, on your blog. Great recipe, thanks. I just baked them with my daughters preschool class, the loved it! We made a thick cross dough (1/2C flour to 2 tbsp water) which they were able to roll out into thin snakes to make the crosses from. Zoe these look fab. I really struggled with hot cross buns this year, the ones I baked were lovely when they were first out of the oven but were like missiles by the next day! I am right on board with chucking out the raisins and adding in choc chips too! Thanks for for giving more information about preparation of Chocolate Chip.